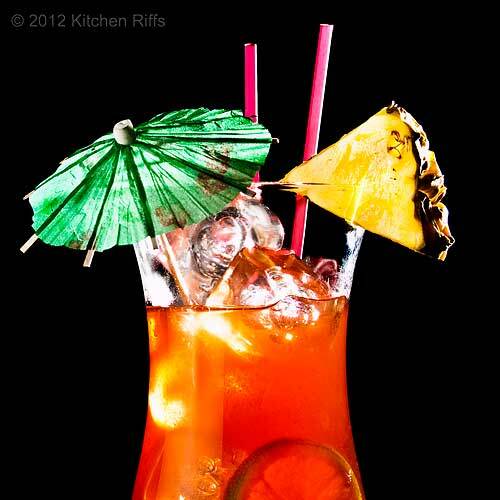 Let’s begin by acknowledging that Planter’s Punch originally had nothing to do with Tiki. How could it? It started out in Jamaica about 200 years ago, while Tiki is an American invention that was born in the 1930s. Still, if Planter’s Punch had not existed, Tiki might not either. I’ll explain that later. But first we need to introduce today’s drink: It’s tall, cool, rum-laden, and delectable. Anything this refreshing has got my number, especially with the miserably hot summer we’re having. It’s no surprise that Planter’s Punch originated in Jamaica. The drink features rum, which is made from molasses, which comes from sugar cane — which is a large cash crop on many Caribbean islands. Including Jamaica. Planter’s Punch was invented to make rum more drinkable. Nowadays there are some fine sipping rums, but back then rum was much rougher and harsher in flavor. To make it palatable, people often mixed in sugar and juices. There’s no definitive recipe for a Planter’s Punch cocktail. It was more a class of drinks (and the name was used generically, the way some people now use “martini” to mean any drink served in a classic Martini glass). Over time, folks developed a rhyme that helped them remember how to mix a Planter’s Punch-class drink: "One of sour, two of sweet, three of strong, four of weak." That is, 1 part citrus juice (almost always lime), 2 parts sugar, 3 parts rum, and 4 parts water. Today, the water in a Planter’s Punch mostly takes the form of melted ice. And because today’s rum is better quality (and most of us don’t like our drinks extremely sweet), we tend to use a bit more sour than sugar. You can find countless recipes for making Planter’s Punch, and they vary a lot (some use several different fruit juices, for example). The best ones tend to use Jamaican rum. Almost all the recipes call for dark rum, though many also include aged amber rum. 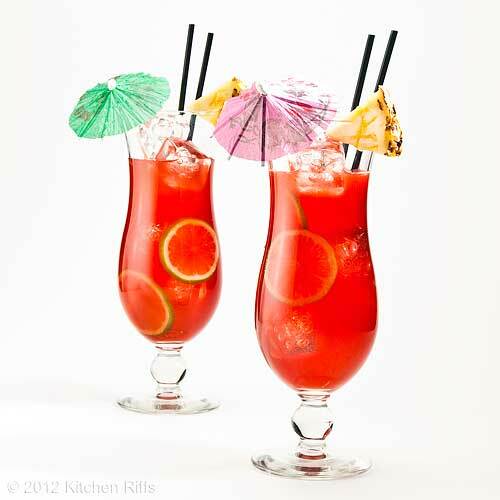 Because there are so many different recipes for Planter’s Punch, I’m presenting two here. The first is David Wondrich’s. It’s good, and doesn’t require any unusual ingredients. The second is adapted from Beachbum Berry Remixed by Jerry Berry (a/k/a Beachbum Berry). It derives from one of the many Planter’s Punch recipes created by Donn Beach, owner of the Don the Beachcomber restaurants (more on him below). I’ve simplified this recipe somewhat (the original calls for 3 different kinds of rum, at least one of which most people don’t have). This recipe has better flavor than the first one, IMO. But it also requires falernum, something that a lot of people will not have on hand (more info on that in the Notes). Both recipes serve one, and take about 5 minutes to prepare. You can easily scale up either recipe to serve more people. The procedure for both versions is identical, so I’ll provide it only for the first. Add all ingredients to a cocktail shaker half-filled with ice. Shake until cold (about 20 seconds). Strain the mixture into a tall (Collins) glass filled with crushed ice or ice cubes. Garnish with fruit, if you choose, and serve. A little cocktail umbrella adds a festive touch. Falernum is a ginger- and lime-flavored syrup. Fee Brothers makes the best commercial one I know of, and many liquor stores carry it. Otherwise Amazon carries it, albeit at a price. If you don’t want to go to the trouble of finding falernum, you could substitute more grenadine or simple syrup. Although you’ll miss falernum’s great spicy flavor, the substitute will add the proper note of sweetness. Rums from different Caribbean islands have differing flavors. Most of us know the Bacardi rums, which hail from Puerto Rico. These rums tend to be very light, sometimes almost flavorless. They are great for mixing in drinks like the Classic Daiquiri. But they’re not so great for drinks like Planter’s Punch, where the flavor of rum is supposed to dominate. Because Planter’s Punch comes from Jamaica, Jamaican rums are perfect in it. Many of these rums (specifically, the dark ones) have a bit of molasses flavor — very pleasant. As noted, I like Meyer’s dark rum. They advertise themselves as the rum for Planter’s Punch (since Meyer’s comes from Jamaica, that seems appropriate). I also like Gosling’s Black Seal rum, from Bermuda (some people think this one has a “root beer” flavor). I find that it works well in both versions of this drink. When it comes to amber rum, I really like Appleton Estate V/X — a great tasting Jamaican rum — for this drink (and many others). Appleton Special Gold would also be a good choice. Donn Beach (originally Ernest Raymond Beaumont Gantt — wonder why he changed his name?) is credited with starting the Tiki craze in 1930s Hollywood. He also founded the Don the Beachcomber chain of Polynesian-themed restaurants. Beach learned to love Planter’s Punch (and rum) while crewing on his grandfather’s yacht — which was making Prohibition-era rum-running trips to Jamaica at the time. Beach also traveled extensively in the South Pacific, and he apparently decided that a Polynesian vibe would add just the right exotic touch to his restaurants. Luckily, rum mixed well with the grass-skirt/thatched hut theme. So while the food and décor at Donn’s eateries may have been faux-Polynesian, the drinks owed their jolt to Caribbean rum. It was Planter’s Punch in particular that first impressed Donn Beach — and later inspired him to create a whole range of rum-laced Tiki drinks, according to Jeff Berry in Beachbum Berry Remixed. 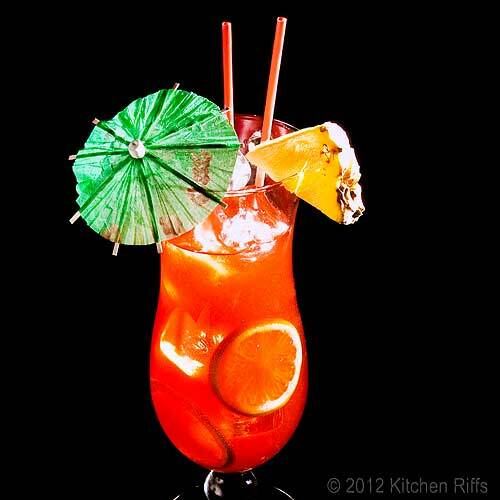 Perhaps the most famous Tiki drink is the Mai Tai Cocktail which we featured on Kitchen Riffs last year. The Mai Tai was created by Victor Bergeron (a/k/a Trader Vic), a California restaurateur who went into the Tiki business after observing Beach’s success (he became a major competitor). After the Mai Tai, the best known Tiki drink surely must be the Zombie. It was Donn Beach’s signature creation — and the drink that put Tiki on the pop-culture map. Read about it here next week. And find out why Beach had to institute a strict limit of two Zombies per customer. I need to start drinking stat. Screw the doctors, what do they know. I need this drink in my life. Now. Hi Cakewhiz, even if you don't drink, there's often an interesting story behind many alcoholic beverages, which is always fun to learn. And many of them are pretty to look at! Thanks for commenting. Hi Kim, what do doctors know? ;-) This is a drink worth having - great flavor. And you can add a little umbrella to it! What could be better? Thanks for your comment. Hi Choc Chip Uru, be patient, you'll be there soon! Garnishing cocktails can be half the fun, although I rarely do it when I want to drink them, just when I photograph them. Thanks for your comment. What a fun drink! I have had Planter's Punch in Jamaica and they were sooooo strong, it definitley left an impression on me lol. Now you've won me over. Rum is my very favourite spirit. Mix it with anything and I am a happy girl. Those cute umbrellas are so much a part of a rum drink. Hi everydaymaven, these drinks do have a bit of booze in them. But the ice melts and dilutes them, and they do take awhile to drink. Great taste, though. Thanks for your comment. Hi Suzanne, if you like rum you'll definitely enjoy this drink! You can really taste the great flavor of the Jamaican rums. Thanks for your comment. Hi Zoe, it's almost a little too warm here! But in a few months we'll be longing for these hot days. Thanks for your comment. I've learned so much about cocktail drinks from your ite that I think I've got enough recipes for the whole summer. 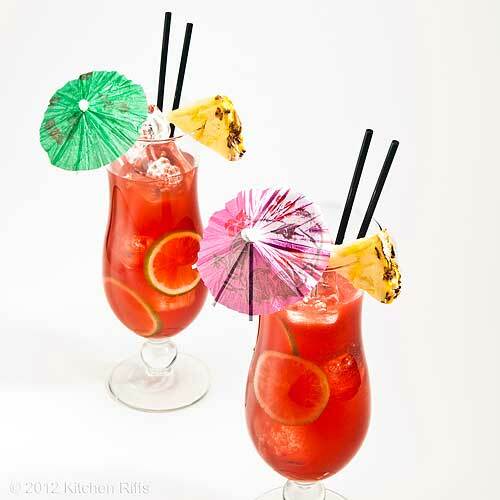 I love the background story of planters punch and your recipe sounds amazing! Thanks for sharing it! Hi Yi, I've had a lot of fun with the Summer Sippin' Series - I'm thinking about doing it next summer, too. The Planter's Punch is really a fun drink, and has great flavor - if you like rum, you'll enjoy it. Thanks for commenting. Whip up a pitcher I'm on my way! Your pictures are amazing!! Hi Marina, for you it's open any time! I hate waiting for people to show up - they're usually late. Thanks for your comment. Hi Baker Street, mixing the ingredients right now! ;-) Thanks for your kind words, and your comment. Hi Carolyn, I put the little umbrellas in just for you! ;-) They do look nice, though a bit frou frou. Thanks for your comment. I always learn something new when I read your posts:) Thanks for sharing. Love the look of this drink btw. Oh, I want that right now! What a delightful beverage. You are a cocktail pro. Hi love2dine, it's a super drink - great for summer. Thanks for your comment. Hi Marta, this is a pretty girly looking drink, isn't it? ;-) Cocktail umbrellas seem to work well in so many rum drinks! Thanks for your comment. Hi tania, thanks for those kind words, and the comment. Hi Rosa, it is a great beverage! Thanks for your comment. Hi Bam, an umbrella to shelter from the heat is a good idea. It's stifling here. We all need a party to escape the heat! Thanks for your comment. Wow, it has finally gotten hotter around where I live, and I am on the lookout for some good, cold drinks. This looks perfect! Hi Cathleen, this is perfect for hot weather! Hope you enjoy. Thanks for your comment. Planter's punch? Why have I never heard of this before? I must have lived under a rock. Planters peanuts, yes :) punch, no. I usually like your black background but today I like the white one more. Such a pretty drink, perfect for the weekend! I don't drink much alcohol yet I still enjoy your drink pictures very very much. It's fun and cheerful! Hi Maureen, I guess you have to make up for lost time! Oh, and I do recommend peanuts with this drink. ;-) Thanks for your comment. Hi Nami, I like the white background much better this time too. And I agree cocktail pictures can be really pretty. Thanks for the kind words, and the comment. I think the Version 1 would be my favourite!! 5 more days of "dry July" and I am definitely heading back to your blog for the perfect "first" drink! Hi Ali, I like both versions, but version 1 definitely has a more direct flavor. After you taste several versions of this drink - and if you search the internet you'll find loads more - you'll start developing your own version! Congrats on only have 5 more days left! Thanks for your comment. Hi Jenny, cocktail umbrellas are fun! Though to be honest, when it's just Mrs K R and myself, we both prefer our drinks without garnish. But they're so pretty in photos. And you're right - sometimes the white background is just more suitable for a subject. Thanks for your comment. I could go for one of these. It has been a long week and this drink sounds like it would be perfect after a long week. Who can resist an umbrella drink? The umbrella speaks refreshing, tasty, a little sweet, and possibly dangerous. Have heard of Planter's punch but have never had one. Sounds like another summer drink to try! I love Jamaican rum and always have a bottle as well as ginger syrup, so I've got somewhat of a start on this. :) Another great drink post! Hi Words of Deliciousness, this is one fantastic end-of-the-week drink. Perfect for when you're just done and want some time to hang loose. Thanks for your comment. Hi MJ, boy, if you want dangerous, wait until I do next week's drink! But I know what you mean about danger + umbrellas - a lot of umbrellas drinks are kinda sweet, so you don't realize what a punch they can pack. I suspect the ginger syrup would be a pretty good substitute for the falernum. Just add a hint of lime, and you're there. Thanks for your comment. Hi Pencil Kitchen, isn't that the truth? Even though umbrellas are a bit silly, they're so much fun. Thanks for your comment. I could really use one of these to cool off with. Your photos are great! Thanks for sharing. Hi Spicie Foodie, the weather here has been ridiculous. I like hot weather, but not close to 100 for days on end! Thanks for the kind words, and the comment. Hi Yudith, there's always next weekend! Thanks for your comment. This is tooooo gorgeous!!! I love it! Such beautiful pictures. Well done.....again! Hi Tia, it's a fun drink. Thanks for your kind words, and your comment. Hi Terra, this is a great beach or pool drink. This one is great for a lazy afternoon when you want a drink that will last for quite awhile. Thanks for your comment.